Chronic fatigue syndrome (CFS) is a clinical condition characterized by severe and disabling fatigue that is medically unexplained and lasts longer than 6 months. Although it is possible to effectively treat CFS, the nature of the underlying physiology remains unclear. Various studies have sought evidence for an underlying disturbance in immunity. The aim of this study was to compare the humoral and cellular immune responses upon influenza vaccination in CFS patients and healthy controls. Identical antibody titers were observed in CFS patients and healthy controls. Patients and controls demonstrated similar seroprotection rates against all three virus-strains of the influenza vaccine, both pre- and post-vaccination. Functional T cell reactivity was observed in both CFS patients and healthy controls. CFS patients showed a non-significant, numerically lower cellular proliferation at baseline compared to controls. Vaccination induced a significant increase in cellular proliferation in CFS patients, but not in healthy controls. Cytokine production and the number of regulatory T cells were comparable in patients and controls. The humoral and cellular immune responses upon influenza vaccination were comparable in CFS patients and healthy controls. Putative aberrations in immune responses in CFS patients were not evident for immunity towards influenza. Standard seasonal influenza vaccination is thus justified and, when indicated, should be recommended for patients suffering from CFS. Chronic fatigue syndrome (CFS) is a clinical condition characterized by severe and disabling fatigue that is medically unexplained and lasts longer than 6 months . The estimated worldwide prevalence of CFS is 0.4-1% . The existing evidence suggests that cognitive behavior therapy, specifically designed for CFS, is an effective treatment option [3–10]. However, although it is possible to effectively treat CFS, the nature of the underlying pathophysiology remains unclear. Hypotheses explaining the pathophysiological mechanism of CFS include morphological and metabolic alterations in the brain, [11–17] diminished central activation of muscles,  altered central nervous system functioning,  a neuroendocrine disturbance,  or cognitive impairment . Furthermore, the presence of an underlying immunological problem has been suggested as an explanation for CFS . Cytokine dysregulation, decreased natural killer cell functioning, the presence of autoantibodies, and a reduced response of T cells to mitogens and other specific antigens have been reported in CFS [2, 19, 20]. If immunity is disturbed in CFS patients, they might have an altered response to vaccination. Vaccines, accompanying adjuvants, and silicone breast implants could act in concert in the development of CFS [2, 19–21]. Therefore, the aim of this study was to compare the humoral and cellular immune responses upon vaccination, using seasonal influenza vaccination as a model of a vaccination, in CFS patients and healthy controls. Baseline characteristics of the participants are presented in Table 1. Data are presented as mean ± standard deviation or as absolute numbers with percentages in brackets. Vaccination induced a significant increase in hemagglutination-inhibition (HI) antibody titers for influenza strain H3N2 and H1N1 in the CFS group as well as in the healthy control group (Figure 1A and 1B). For influenza strain B, vaccination induced no significant increase in HI antibody titers, neither in the CFS, nor in the healthy control group (Figure 1A and 1B). No significant differences in HI antibody titers between both groups were observed prior to vaccination or at day 22. Compared to the healthy controls, CFS patients demonstrated similar seroprotection rates (both pre- and post-vaccination) and seroresponse rates against all three virus-strains (Table 2). Hemagglutination inhibition antibody responses before (day 1) and after (day 22) influenza vaccination, and cellular proliferation before (day 1) and after (day 8) influenza vaccination. Both immune responses are presented for the three influenza strains of the vaccine (H3N2, H1N1, and B), in chronic fatigue syndrome patients (A and C) and healthy controls (B and D). Antibody titers are presented as mean ± standard error of the mean, the dotted line indicates the protective titer cut-off value. Proliferation counts are presented as absolute numbers and mean (horizontal line) on a logarithmic scale. Data are presented as absolute numbers with percentages in brackets or as mean ± standard error of the mean. Prior to vaccination, T cells proliferated upon phytohemagglutinin (PHA) and virus stimulation in both CFS patients and healthy controls (respectively 14,883±4,265counts and 22,997±3,902 counts), indicating that these T cells are functional (Figure 1C and 1D). Cellular proliferation showed no significant differences between CFS patients and healthy controls at baseline (Table 2). Of note, in absolute counts, CFS patients showed at baseline a lower T cell proliferation upon stimulation in comparison with controls. Interleukin-10 (IL-10) production and the number of regulatory T lymphocytes (Treg) were not significantly different between CFS patients and healthy controls at baseline (Table 2). Vaccination induced a significant increase in cellular proliferation in CFS patients after stimulation with influenza strain H3N2 and B, and a trend in the same direction for strain H1N1, whereas in healthy controls vaccination induced no significant change in cellular proliferation after stimulation with any of the three virus-strains (Figure 1C and 1D and Table 2). Post-vaccination, T cell proliferation showed no significant differences between CFS patients and controls, neither for the three different virus strains (Figure 1C and 1D), nor for PHA (respectively 34,964±4433 counts and 15,406±2719 counts). Of note, in absolute counts, CFS patients showed post-vaccination more proliferating T cells upon stimulation with all three virus-strains, compared to controls. Interferon gamma (IFN-γ), interleukin-4 (IL-4), and interleukin-5 (IL-5) production post-vaccination were not significantly different between CFS patients and healthy controls (Table 2). To the best of our knowledge, we are the first to explore both the humoral and cellular immune responses after influenza vaccination in CFS patients. The hypothesized immunological aberrancy claimed to be operative in CFS could not be confirmed by our data. 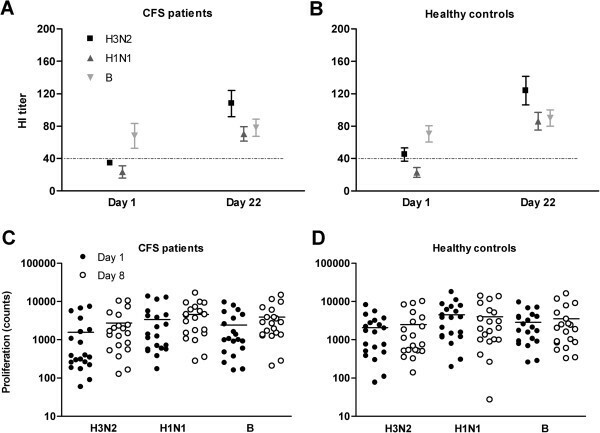 Both CFS patients and healthy controls showed a significant increase in humoral immune responses from pre- to post-vaccination for virus-strains H3N2 and H1N1. Virus-strain B did not show such an increase from day 1 to day 22, but for this virus-strain the HI titer was already high prior to vaccination. In a previous study, only the effect of influenza vaccination on the antibody response of CFS patients was determined in 40 CFS patients and 21 matched healthy volunteers . In accordance with our study, influenza vaccination provided protective antibody levels. Our study gives additional information on cellular immune responses in CFS patients. We observed that, although not statistically significant, the incorporation of tritium thymidine by proliferating T cells at baseline was numerically lower in patients suffering from CFS in comparison to healthy controls. To investigate whether it is worthwhile to investigate this trend in more detail, we studied immunological mechanisms commonly known to suppress immunity. First, the immunosuppressive cytokine IL-10, which is able to inhibit T cell proliferation, was assessed . However, production at baseline of IL-10 was similar in patients and controls. Secondly, Treg are known to negatively modulate T cell responses . Nevertheless, the percentage of Treg in CFS patients at baseline did not differ from the controls. Another possible explanation for the decreased number of proliferating T lymphocytes in CFS patients is elevated numbers of co-inhibitory molecules, like programmed death-1, [25, 26] cytotoxic T lymphocyte antigen-4,  or B and T lymphocyte attenuator . Whether inhibitory mechanisms play a role in CFS patients need to be explored in more detail. From pre- to post-vaccination, CFS patients showed a significant increase in cellular proliferation in two out of three virus-strains and a trend in the same direction for the third virus-strain, whereas healthy controls did not show a significant change in proliferation from day 1 to day 8. In absolute counts, CFS patients showed post-vaccination more proliferating T cells for all three virus-strains, compared to controls. This non-significant elevation in cellular immune responses could not be explained by an increase in the levels of cytokines IFN-γ, IL-4, and IL-5, cytokines involved in the type 1 and type 2 helper T cell responses, suggesting a type 0 helper T cell response in CFS patients after vaccination. Given the exploratory nature of this study, group sizes were relatively small and not based on power calculations. Consequently, subtle differences between CFS patients and healthy controls may have gone unnoticed. However, the sample size of our study was sufficiently high to show that CFS patients are able to mount a significant protective antibody response and a sufficient cellular immune response upon a single shot of influenza vaccine. In conclusion, putative aberrations in immune responses in CFS patients were not evident for immunity towards influenza. We show that CFS patients are able to mount a protective antibody response and a sufficient cellular immune response upon a single shot of influenza vaccine, which is comparable with healthy controls. Therefore, standard seasonal influenza vaccination is thus justified and, when indicated, should be recommended for patients suffering from CFS. The study population consisted of a group of CFS patients (n=20) and a group of healthy controls (n=20). CFS patients fulfilled the Centre for Disease Control and prevention criteria for CFS  and were referred for cognitive behavior therapy to the Expert Centre for Chronic Fatigue of the Radboud University Nijmegen Medical Centre (RUN-MC, Nijmegen, the Netherlands). CFS patients were asked to bring a gender- and age-matched non-fatigued friend as a control. Fatigue severity was measured by the fatigue severity subscale of the Checklist Individual Strength (CIS-fatigue) [28, 29]. A cutoff score of ≥35 points on this subscale indicates severe fatigue and a score of <27 points signifies normal fatigue feelings. All participants were between 18 and 60 years old. The local ethics committee of the RUN-MC approved the study and all participants provided written informed consent. Between September 2010 and January 2011, all participants were intramuscularly vaccinated with a single dose of the inactivated trivalent split influenza vaccine (VaxigripR, Sanofi Pasteur MSD, Hoofddorp, the Netherlands), which contained inactivated, split virion of the three influenza strains (A/H3N2/Perth/16/2009, A/H1N1/California/7/2009, and B/Brisbane/60/2008). Peripheral blood mononuclear cells (PBMC) were collected at baseline (day 1) and 7 days after vaccination (day 8), and serum was collected at baseline and 21 days after vaccination (day 22) . The humoral immune responses on influenza vaccination were measured in serum by the HI antibody test as described previously . The virus antibody responses were measured at day 1 and day 22 for the three different influenza strains of the vaccine (A/H3N2/Perth/16/2009, A/H1N1/California/01/2010, and B/Florida/004/2006). Seroprotection was defined as an antibody titer of at least 1:40 [31, 32]. Post-vaccination seroresponse was defined as at least a four-fold increase in titers . The cellular immune responses were measured by T lymphocyte proliferation and cytokine secretion of PBMC collected at day 1 and 8, and the presence of Treg at day 1. For analysis of lymphocyte proliferation and cytokine secretion, 1.5x105 PBMC were added per well of a 96-wells plate in culture medium (RPMI 1640 supplemented with 4% human serum albumin). In the proliferation assay, PBMC were incubated with 1μg/ml PHA and with a 1:10 dilution of the separate virus-strains (A/H3N2/Perth/25/11/2008, A/H1N1/California/01/2010, and B/Florida/05/11/2008). After 48 hours of culture, supernatant was harvested to analyze cytokine production. The Th1/Th2 11plex kit (eBioscience, San Diego, CA) was used according to the manufacturer’s protocol in order to measure IL-10 at day 1 and IFN-γ, IL-4, and IL-5 at day 8. After four days of culture, 1 μCi 3[H]-thymidine (MP Biomedicals, Santa Ana, California, USA) was added to each well for overnight incubation to measure T lymphocyte proliferation. Multi-color flow cytometric analysis was performed on unstimulated PBMC collected at day 1 according to the manufacturer’s protocol. Cells were stained for anti-CD4/FITC (Beckman Coulter), anti-CD25/PE-Cy7 (BD Biosciences, Breda, the Netherlands), anti-CD127/PE (BD Bioscience), and anti-FOXP3/APC (clone PCH101, eBioscience). Treg were defined as CD4+CD25++CD127-FOXP3+ and were expressed as a percentage of CD4+CD25++CD127- cells. Statistical analyses were performed using PASW for Windows®, version 18.0.2 (Armonk, New York, USA). Independent samples t tests were performed to assess differences in numerical variables at day 1, 8, and 22. Paired t tests were used to assess changes in numerical variables from pre- to post-vaccination. Chi-square tests were performed to compare groups on categorical variables. Differences were considered statistically significant at p<0.05. This work was supported by Pharmachild and the Paul Speth Fund, but they were not involved in the study design, in the collection, analysis and interpretation of data; in the writing of the manuscript; and in the decision to submit the manuscript for publication. We thank all patients who participated in this study; all physicians for referring patients; colleagues from the outpatient clinic of Medical Oncology for influenza vaccination and blood collection; colleagues from the Tumor Immunology Department for assistance with PBMC isolation, experiment performance, and helpful advice. HP is primary investigator and is responsible for patient recruitment, data collection, data analysis, and drafting the manuscript. HvL and JdV obtained funding for the study. HvL, JdV, RT, JP, SM, CvH, and HP designed the study. GB and LE assisted in patient recruitment. FS was responsible for the hemagglutination-inhibition antibody test. JP assisted in data collection and data analysis. HvL, JdV, RT, GB, LE, and FS supervised the study. All authors read and approved the final manuscript.